The Harmony Arts Festival, presented by Odlum Brown Limited, is entering its 28th year with a cornucopia of festival favourites and some exciting new additions. 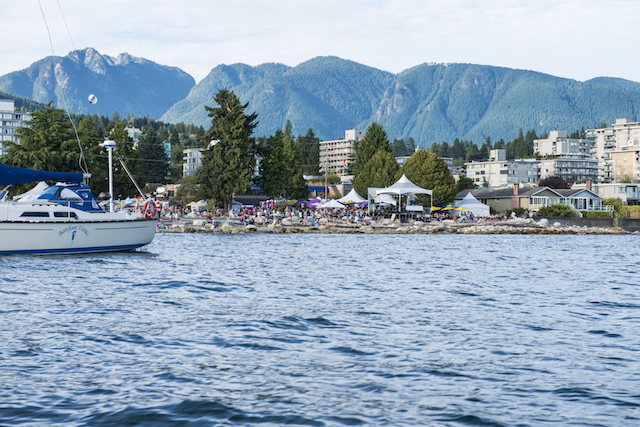 Enjoy a variety of free events and activities including live concerts, art exhibitions, outdoor installations and culinary events along the Ambleside waterfront this August. A new Indigenous Exhibition, sponsored by BMO Bank of Montreal, will include an authentic marketplace and group exhibition, starting with a traditional welcome on Friday, August 3, 2018. The inaugural Indigenous Feast featuring Salmon n’ Bannock will take place on Tuesday, August 7, 2018 on Ambleside Landing. We are proud to offer a stunning feature artwork designed by a Coast Salish artist, Sinámkin Jody Broomfield, which pays homage to the spirit of the eagles who live near Ambleside and John Lawson Park. Salt & Earth Catering Co. brings savoury treats to the Salt & Earth Oyster Bar in the RE/MAX Waterfront Lounge for all 10 days of the festival. Enjoy music, film, art, literature, food, and more at Harmony Arts! The Fresh St. Market Art Market features a wide range of juried products including ceramics, glass, jewelry, leather, painting, photography, textiles and wood. The market runs both weekends (August 3–6 and August 10–12) on Argyle Avenue. ArtSpeaks, sponsored by British Pacific Properties, features a range of workshops, demonstrations and artist talks at the Ferry Building Gallery. The Group Exhibition, sponsored by the Always Best Care Senior Services, is an outdoor exhibition, open daily. Located at Ambleside and Dundarave storefronts, Art Beat, sponsored by Cressey Development Group, showcases local artists in more than 40 local businesses. For the Love of Art, sponsored by Kin’s Farm Market showcases youth art in an outdoor exhibition, open daily. Artsy Kids, sponsored by the North Shore News, offers a fun and messy creative outlet for kids. Drop in for crafting, painting and other fun workshops. PARC Retirement Living Garden Concerts at the PARC Retirement Living Garden Stage in Millennium Park offers three different performances daily with daytime concerts, dinner concerts at 5:30pm and late-night concerts at 8:45pm. Onni Group Sunset Concerts also offers nightly performances at 7:30pm on the Main Stage. Enjoy the classics from 2:00pm-4:00pm on August 5, 6 and 12, during the Seniors’ Series sponsored by Hollyburn House. Jazz by the waterfront returns with Live Music at the Silk Purse. Sample delicious family-style Italian fare from La Sorella Di Mangia in the RE/MAX Waterfront Lounge in Millennium Park. The Park Royal Beachside Patio in Millennium Park features down-to-earth cuisine from a pop-up restaurant created by Feast Dining. Artisan Eats, sponsored by Just Like Family Home Care, turns John Lawson Park into a mecca of mobile food trucks. The always-popular Best of the West, sponsored by Grosvenor Americas, is a ticketed food and wine pairing event. 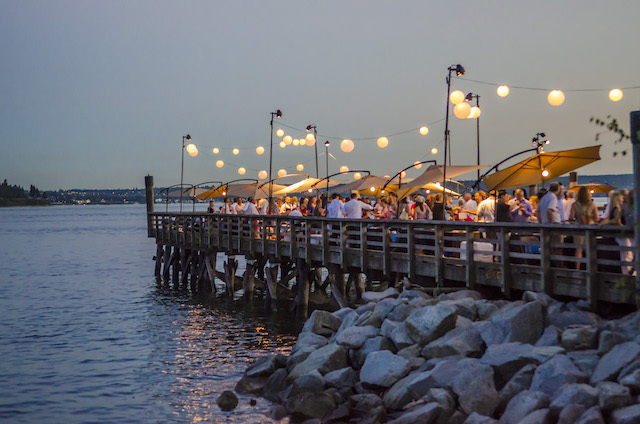 Twelve local restaurants and wineries compete for culinary mastery on Ambleside Pier. Catch innovative cocktail stylings from bartenders at the ticketed Night on the Pier. Cinema in the Park: enjoy a film in the park. For movie lovers and cinephiles, Cinema in the Park, sponsored by West Vancouver Optometry, offers free nightly movies every evening at 9:00pm on the Main Stage. Readings in the Park, sponsored by Bridgewater Tile Ltd., features Canadian poet, Joy Kogawa. This is a perfect event for literary lovers and written word aficionados. The Harmony Arts Festival, sponsored by Odlum Brown Limited, celebrates the rebirth of cocktail culture at the 3rd annual Night on the Pier. It’s a vibrant and exhilarating evening on Ambleside Pier that features some of the best bartenders from around the Lower Mainland. Each mixologist competes to create innovative, daring and bold drinks for you to enjoy. Paired with delicious catered food and a stunning waterfront view, Night on the Pier is the place to be. I will draw one winner at random from all entries at 10:00am on Saturday, August 4, 2018. Must be 19+. Please enjoy responsibly. Follow the Harmony Arts Festival on Instagram, Facebook, and Twitter for more info. Update The winner is Jennifer R! Perfect date night at Harmony Arts Festival. Cheers ! Would be fun to attend it! Twitted @drama_otaku too! What a great night that would be. I would love to go. This sounds like a great evening event. Thanks! I would love to go to Night on the Pier! Looks like the perfect night out! Drinks, food and an amazing view! I’d love to take my wife! That is a perfect summer evening, basking in the ocean breeze while sipping on a cocktail seaside & enjoying some yummy nibbles, yes please an amazing prize! What a great event! It would be awesome to attend. I would love to take my mom. Sounds like a fun date night! It would be fantastic to win! This sounds like fantastic fun. Hope I win tickets to Night on the Pier! Love ❤️ to win this night out on the pier! This will be my and David’s 10th year enjoying Harmony Arts together. We would love to experience Night on the Pier! Yes please! I’ve never been so would love to check out! Awesome! I can’t believe I have never been. Thanks for the chance! Would love to go and write this one up! This would be an amazing date night!! Sunset 🌅 on the pier and delicious food 🍢🍹drinks! I’d love to go! Looks like it would be a wonderful night! This would be great! Drinks and delicious food on the Pier! What an amazing event. I would love to win. This sounds like it will be a fantastic night and a really exciting festival to check out! Wounds amazing, would love to win. Cocktails, food, ocean view and great people, what a night !! Have been going to the Festival since 1997 but have never been to this particular event and would LOVE to go! Love to win this tickets. We have been going there almost every night for he past few years. Love it. Thanks for sharing. We have been going to the festival for the past few years and love it. Thanks for sharing this tickets. Oh goodness! This would be a romantic date night for me and my partner! Fingers crossed! Sounds like a wonderful evening. Hope it’s us! In my very immodest opinion, I think the Harmony Arts Festival it is one of the absolute best in the Lower Mainland. It includes a wide variety of musical styles, community art displays and very high quality foods. It is also easy to get to by bike, bus, or, on foot. No car needed. With the ocean as the backdrop and a beautiful view of the Moon at night, what could be more perfect?! I have never attended this event yet. This is really a great festival with activities for everyone. I would love to win. Just in time for a birthday celebration lol! I go every year to enjoy this festival. A dinner would the cherry on top this year. What a wonderful event to enjoy! Sounds lovely, thank you for the opportunity! This would be the perfect date night. Those food events look phenomenal.. Looking forward to it~fingers crossed! Sounds like so much fun! I’d love to go😊! I would love an excuse to go to West Van and enjoy Ambleside Park. What a perfect evening this would be. A night on the pier!!! Thanks for highlighting this event! Looks like fun! Wpuld be a fantastic evening to experience! Would love love to go to this!! I’d love to go! Great event! It would be great to try the event.